Fish use their sense of smell to find food, avoid predators, find spawning areas, even recognize one another. Losing it could threaten their survival. “In the environment, that has some serious implications,” said Jason Sandahl, whose research team at Oregon State University was one of the first to show how contaminants can disrupt the chemical balance of sea creatures, and that copper levels at just two parts per billion impaired small coho salmons’ sense of smell. Research from the University of Washington and NOAA’s Northwest Fisheries Science Center is the first to show that high levels of carbon dioxide impair the sense of smell in salmon. Researcher Chase Williams and his colleagues exposed young coho salmon in tanks for two weeks to different acidity levels from today and predicted at 50 and 100 years out. Ground-up fish scales were added to indicate a predator attack, which usually prompts the salmon to hide or swim away. The juvenile cohos exposed to the higher acidity levels did not appear to even detect the smell. Boats have been out in the Gulf and Bering Sea since Jan. 1 targeting cod. Openers for pollock, flounders and various other whitefish kick off on Sunday. Divers are still tapping away on the last bits of Southeast’s 1.7 million pound sea cucumber quota in just one open region. Divers also are still going down for more than 700,000 pounds of giant geoduck clams. The winter king salmon season for Southeast trollers opened Oct. 1 and it’s been slow going. Fewer than 6,000 kings have been taken since the fishery opened; the five-year average is closer to 16,000 fish. Based on new treaty agreements with Canada, Southeast’s winter troll catch rate will determine the takes for commercial and sport users this year and that will likely mean more cutbacks. Boats at Kodiak, Chignik and the South Alaska Peninsula are fishing for rockfish and a half-million pound Tanner crab fishery opened at Kodiak on Tuesday. The state Board of Fisheries is meeting in Anchorage through Saturday to take up more than 60 proposals for Arctic/Yukon/Kuskokwim fish issues. Stakeholders will learn later this month how much halibut will be available for this year’s fishery, which begins in March. The International Pacific Halibut Commission will announce the catch numbers and other management updates when it meets Jan. 28 through Feb. 1 in Victoria, British Columbia. Each of five, 540-foot sailboats will be able to produce 5.5 million pounds of salmon per year. Undercurrent News reports that the first vessel — called the Quadriga — is already being built at a Chinese shipyard. 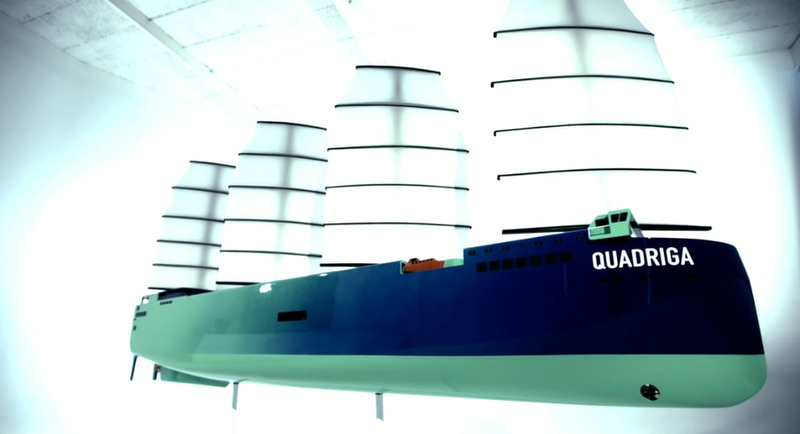 The Quadriga will operate on solar and wind power and will choose routes that best cater to fish growing. Next Generation also claims the vessels will use controlled feeding and incur “no feed losses” into the ocean. A promotional video describes the Quadriga as a "first in the Ecoliner class,” and says it will include luxury passenger cabins on board. A Norwegian company called Pure Atlantic AS is planning an even bigger fish-growing ship measuring 1,600 feet in length. Fish Farming Expert reports it will be powered by wind turbines mounted on the back of the vessel and water will flow through the ship into built-in channels in the fish cages. Premature birth is the leading cause of death for children under 5 years old worldwide, accounting for nearly 1 million deaths annually. A recent review of studies conducted around the globe says that eating seafood or marine oils can significantly reduce that number. The conclusion of an updated Cochrane Review of 70 studies worldwide on nearly 20,000 pregnant women stated that omega-3 fatty acids from marine sources reduces early premature birth by 42 percent. “The effect really has to be strong to see it in a Cochrane Review, and I am very impressed that it has come out as significant as it has,” said Dr. Tom Brenna, a professor of pediatrics, chemistry and nutrition at Dell Medical School at the University of Texas. The results also included a 10 percent reduction in low-birth-weight babies of under 5.5 pounds. Premature babies are at higher risk of a range of long-term conditions, including developmental delay, learning difficulties and visual impairment. Brenna said marine-based omega-3 fatty acids also improves those problems. A challenge now, Brenna said, is to translate the marine omega-3 findings on premature birth prevention and other positives into health policy and wider educational outreach.